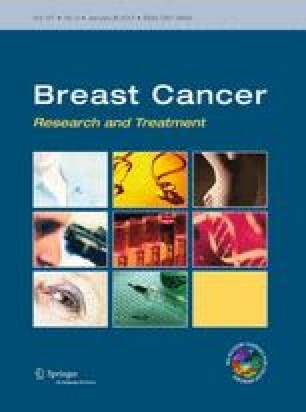 To determine the impact of adjuvant treatment with tamoxifen and aromatase inhibitors (AI) on the survival of men with breast cancer. We analyzed 257 male patients with hormone-receptor-positive breast cancer from numerous German population-based cancer registries treated with tamoxifen (N = 207) or aromatase inhibitors (N = 50). The median follow-up was 42.2 (range 2–115) months. Median age at diagnosis was 68 (range 36–91) years. Thirty-seven (17.9 %) patients treated with tamoxifen and 16 (32.0 %) patients treated with AI died (log rank p = 0.007). After the adjustment for the patient’s age, tumor size, node status, and tumor grading, the AI treatment was linked to a 1.5-fold increase in risk of mortality compared to tamoxifen (HR 1.55; 95 % CI: 1.13–2.13; p = 0.007). The overall survival in male breast cancer was significantly better after adjuvant treatment with tamoxifen compared to an aromatase inhibitor. Tamoxifen should be considered as the treatment of choice for hormone-receptor-positive male breast cancer. We would like to thank Mathias Uhlig, PhD, Sabine Kleinefeld, and Christiane Praetor for their excellent work in project and data management. We would also like to thank the following cancer registries for their cooperation, without which this study would not have been possible: Tumorzentrum Augsburg, Krebsregister in Klinikum Bayreuth GmbH, St. Gertrauden-Krankenhaus (Tumorzentrum gemeinnütziger und konfessioneller Krankenhäuser in Berlin (TZGKB)), Vivantes Tumorzentrum (Berlin), Tumorzentrums Chemnitz e.V., Tumorzentrum of the Staedische Klinikum in Dessau, Tumorzentrum Erfurt e.V., Tumorzentrum Ludwig Heilmeyer (Comprehensive Cancer Center Freiburg), Arbeitsgruppe zur Koordination Klinischer Krebsregister (AKKK) Giessen, Tumorzentrum Ostsachsen e. V. Goerlitz, Tumorzentrum Halle, Gynaekologisches Tumorzentrum am Diakonie-Klinikum Hamburg, Tumorzentrum Heilbronn-Franken, HELIOS Klinikum Berlin Buch, UniversitätsTumorCentrum Jena, Tumorzentrum Koblenz am Kemperhof, Tumorzentrum Land Brandenburg, Tumorzentrum Magdeburg/Sachsen-Anhalt e.V., Tumorzentrum Neubrandenburg, Tumorzentrum Südharz e.V. in Nordhausen, Krebsregister Rostock, Tumorzentrum Schwerin-Westmecklenburg, Tumorzentrum Suhl e. V., and the Tumorzentrum Zwickau e.V.